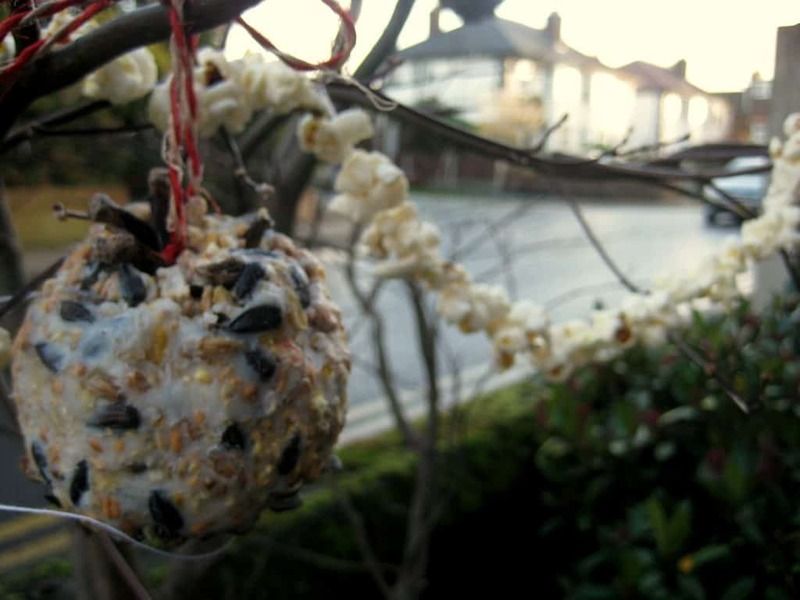 Here are four easy ideas you can use to make a bird feeder – and if you make them all, you can hang them together on a tree outside to make an Christmas tree that gives your feathered friends a festive feast. Stringing up some popcorn chains to wind around your tree will make it look just like you’ve added some bird-friendly tinsel. 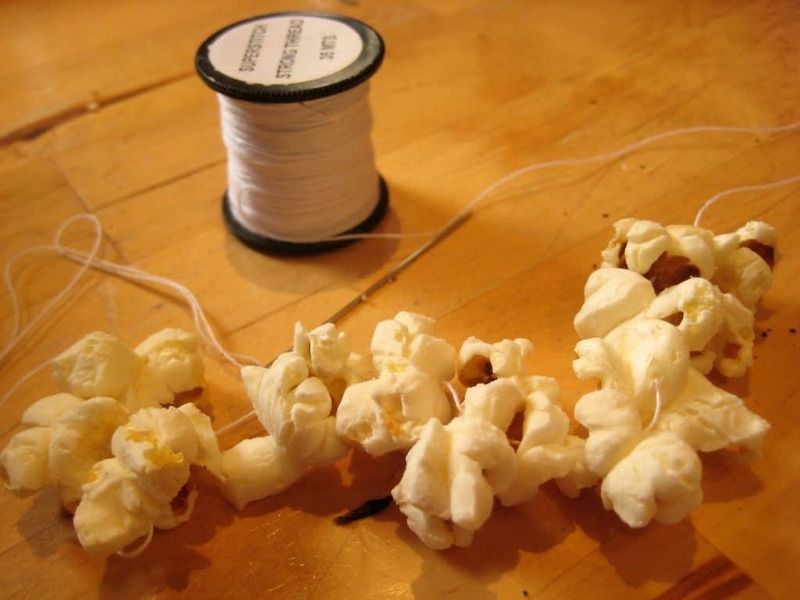 All you need to do is pop some corn kernels (with no added salt or sugar) and then use a needle to put them on to some thread. You can make your chain as long as you like to fit your tree. Leave some lengths of thread at either end so you can tie it in place. You’re even allowed to eat a few pieces of popcorn as you work! 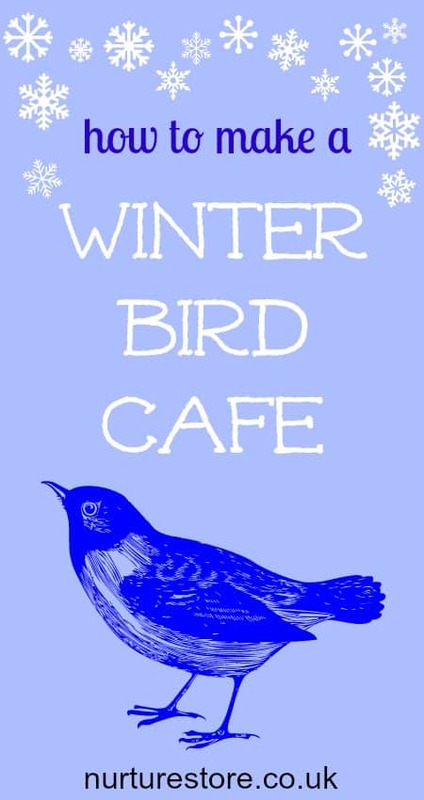 To make a cafe bar bird feeder you need to use a small plastic pot. Use a craft knife to make a small hole in the bottom then find two sticks to make perches – twigs, lollipop sticks or kebab skewers all work well. Cross them over and secure with a little sticky tape. 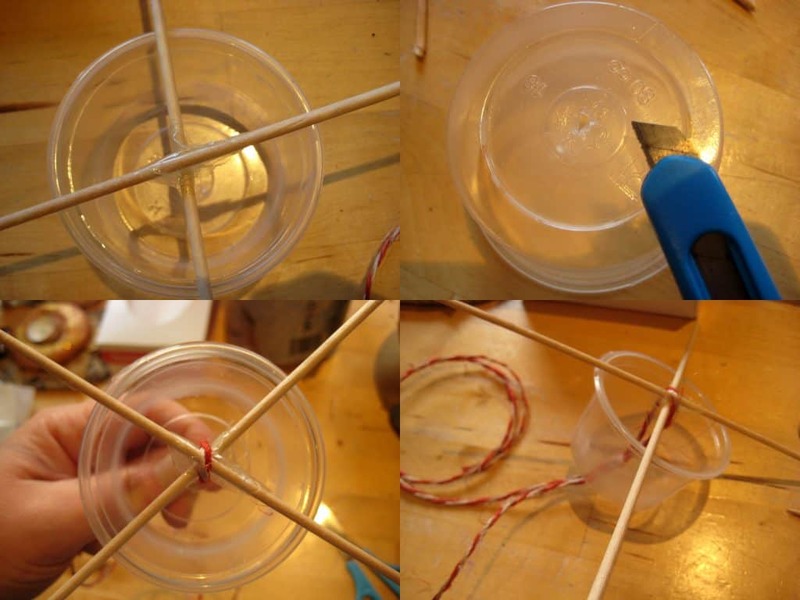 Use some string to thread through the hole in your pot, around the sticks and back through the hole again. This holds the sticks in place and gives you a handle at the top of your feeder to tie to the tree. 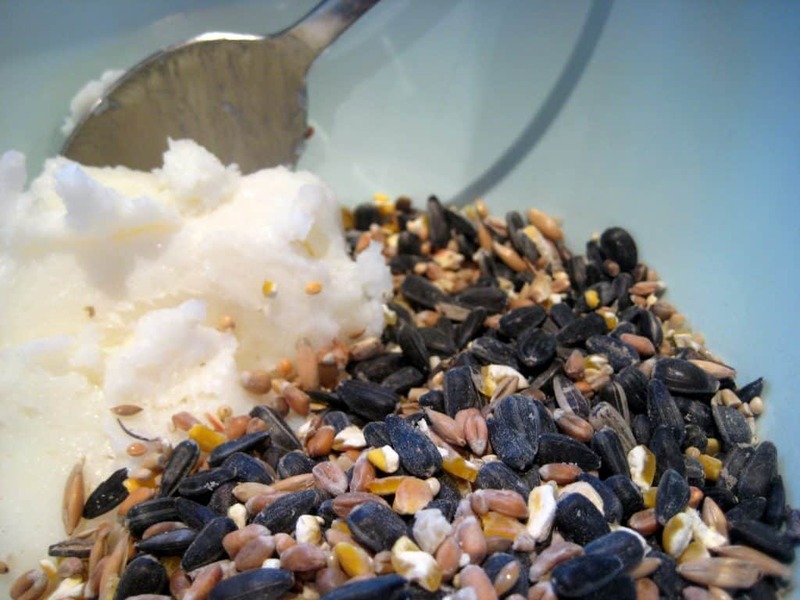 Make your bird feed by mixing one part lard with two parts bird seed. You can also add in raisins, peanuts or grated cheese. You can use a spoon or get stuck in and squish it all together with your hands. Do not melt the lard (or it will run out through the hole in your plastic pot) but have it at room temperature so it’s easy to combine with the seeds. Pack the seed mix into your plastic pot and press it down well. Let it chill and harden in the fridge for an hour or so. Once the seed mix is solid you can pop off the plastic pot and then use the string handle to hang it up – a seed cafe ready for the birds to visit. 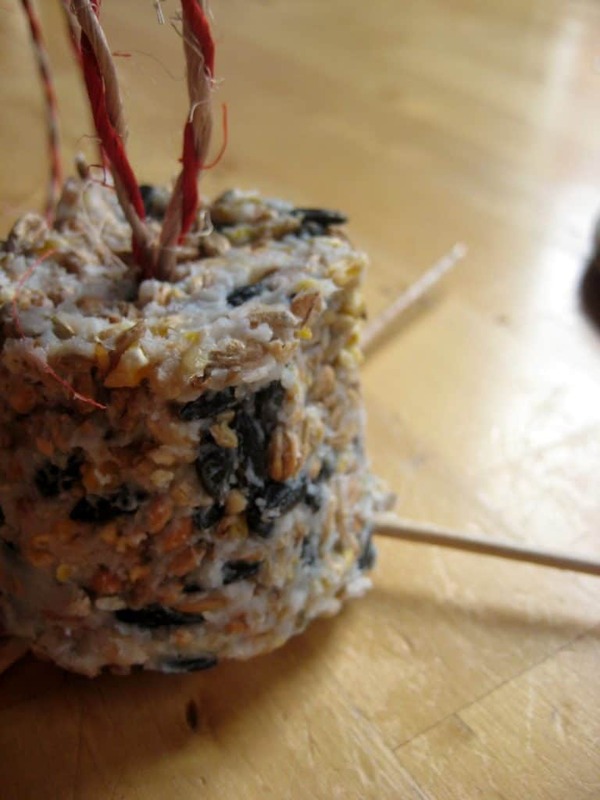 You can use this same bird seed mix to make a fircone feeder too. 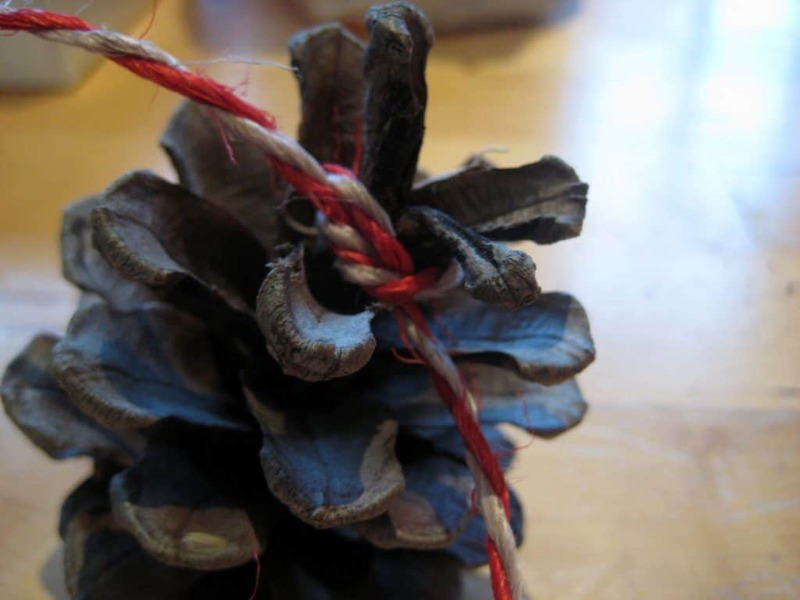 Just tie some of your string to the top of the fircone and use your fingers to squish the seed mix into all the nooks and crannies. 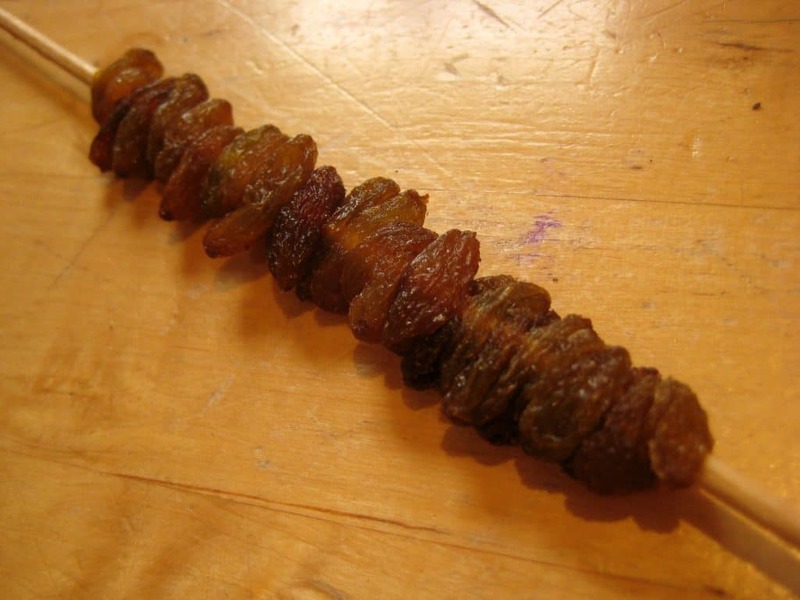 This one was B’s invention: a kebab stick threaded with juicy raisins, with some string tied at the top to hang it from your tree. 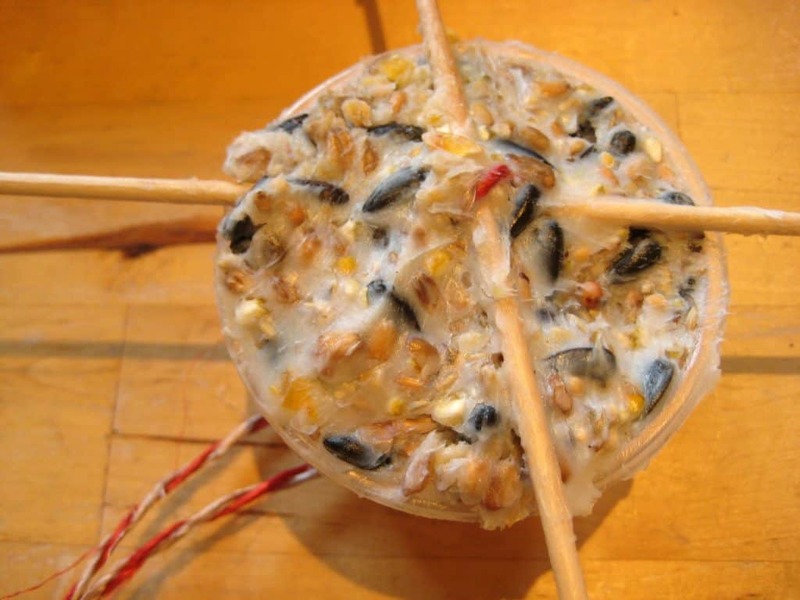 Once you’ve made a variety of bird feeders you can head out into the garden to deck your outside Christmas tree. 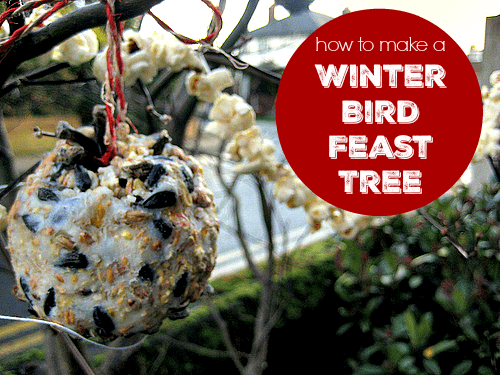 Of course, it doesn’t have to be a fir tree that you use – the bird feeders transform bare branches really nicely. If you can, pick a tree that you can see clearly from where your children play, then they can watch the birds come and feed and know they’ve shown their feathered friends some Christmas kindness. Oooh love all your bird feeders… and love that some of them have a perch. We made some last year and the birds didn’t like ANY of our fare… 🙁 will have to try again! 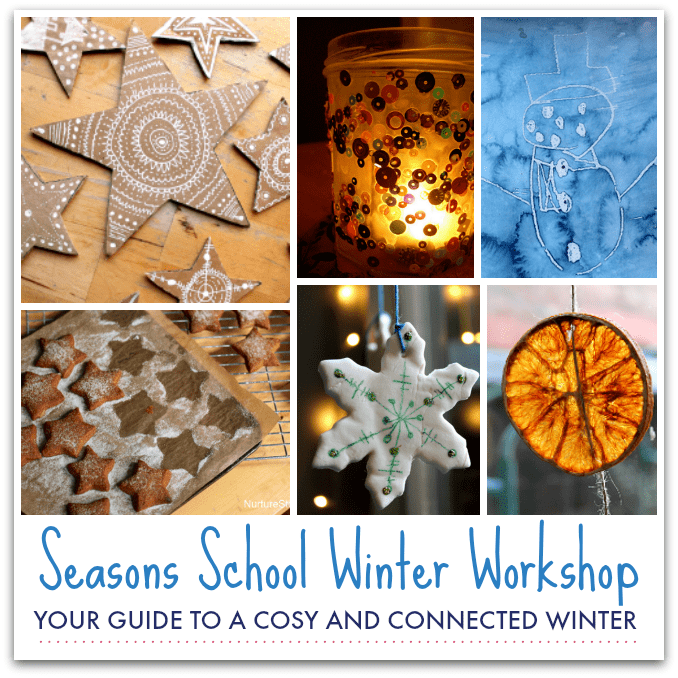 Very unique and lovely ideas for Christmas! Thank you Cathy! Great ideas! 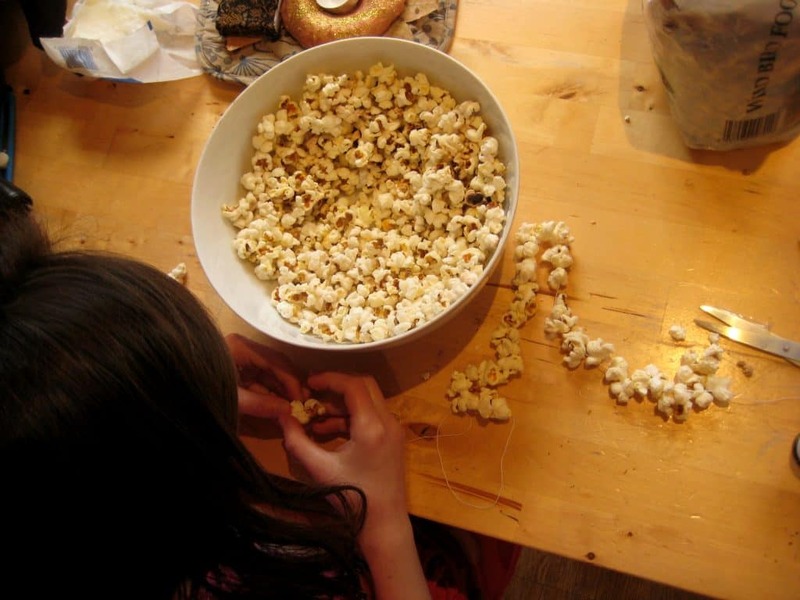 Last year we made popcorn chains and hung whole apples but I love the other ideas! This is coming up on our personal calendar, so I can’t wait to give the other ideas a try! Wonderful post!!! On top of feeding the birds I bet it is also a lovely decoration for your front yard. All of these are great! Must put birdseed and lard on my shopping list now! What awesome ideas!!! We’ve been meaning to do this for a LONG time. Maybe while we’re down south we’ll try these! I was just looking for ideas for a bird feeder – perfect timing! Thanks! Love this! Because it is so much warmer where we are than the rest of the world, we can do this anytime!!! I love all your ideas. We just read a book for our Christmas book advent countdown called Night Tree by Eve Bunting. It was really cute about a tradition of decorating a tree in the forest on Christmas Eve for the birds and animals. I love this idea. I am going to spend some time doing this with my kids tomorrow. This is a great idea! I love it. Please come and link up at Thinky Linky Thursday! So love this post. Wonderful ideas we can’t wait to do this. These are gorgeous! We must make some this winter for our little robin! So cute! Thanks for linking up to Thinky Linky Thursday at Cachey Mama’s Classroom! We’ve been pinspired by this post!! Thank you for the great ideas! We spread peanut butter on the pinecone first and then stuck the seeds to it. Thanks for the additional ideas. I usually make suet bird feeders, they seem to be the most popular among the wild birds of my area. OMG I LOVE all these ideas! I added a link to this page on my teaching blog under bird actvitiies for kids! I can’t wait to get started with my class when we get back from winter break! Thanks Vanessa – happy new year!